Critical machines like Turbines, Generators, Compressors and all other complex machinery is already often monitored with a permanently installed Protection System. 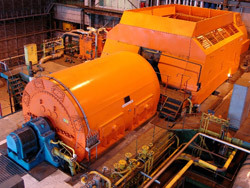 This monitoring concept will in case of a malfunction only give and alert and can, in some cases, prevent large secondary damages by tripping the machine. Due to the lack of analysis options and data storage, it is not possible to determine the real condition of the machine. For online condition monitoring and for trouble shooting problems, van Geffen VMS uses the "XP32 Machinery Health Expert", a 32-channel, state of the art Prediction System with continues data storage and advanced analysis options. A 'root-cause' analysis or the evaluation of a complete machine train can surpass even the most sophisticated 2-channel portable analysers. For the measurement of a run-up, coast down or for the analysis of other rapidly changing events, multi-channel equipment with continues and simultaneous recording capabilities is necessary. Van Geffen VMS uses a fully mobile 32-channel meausurement system for the monitoring and trouble shooting of complex machinery and installations in sectors as power generation and oil- and gas; as well onshore as offshore. Van Geffen VMS satisfies the need between two-channel portable analyzers and permanently-installed Protection Systems. The portable XP32 Machinery Health Expert is suitable for quick and fast measurements to trouble shoot a pinching problem, but can also be installed for longer periods in order to diagnose load, speed or batch dependent problems. Also for turbines, compressors and generators that already are equipped with a protection system we offer reliable condition monitoring programs. 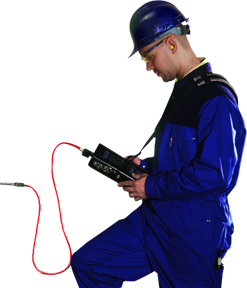 The minimal effort of connecting our mobile measurement system only twice a year will give you a clear and reliable insight in the true condition of the machinery. This simple and low-cost solution will give you the confidence you are looking for. In case of a machine malfunction, the gathered trend- and analysis data will also give essential information for a root cause analysis and can prevent reoccurrence of the problem. The costs for the application of the XP32 Machinery Health Expert are in no relation to the losses of an unexpected downtime. For many years Van Geffen VMS is successfully active with the monitoring and trouble shooting of complex machinery and installations in sectors as power generation and oil and gas production.